Where to start? That was the question that lingered in my mind when it came time to write up the feature on Vaughn Gittin Jr.'s Team NFS RTR-X. 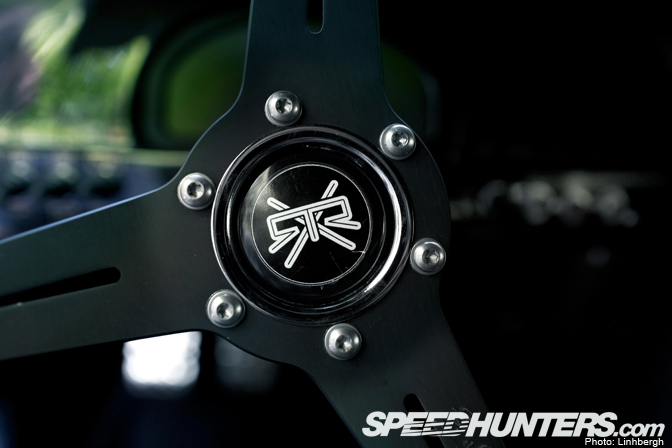 Unlike a lot of the cars we feature here on Speedhunters, the RTR-X is something that many of you are already familiar with – whether you followed Vaughn's build posts, saw the car at an event, or even drove it virtually in an NFS game. I personally became quite attached to the project as I photographed its construction from start to finish, and that's a large reason while I was called upon to write this feature. The RTR-X is not so much a car as it is a vision. A vision that's been brought to reality by an extremely talented group of people working together closely. Whether it was Vaughn leading the project, Andy Blackmore's creative talents, Gary Steen's amazing fabrication skills, or the long nights that Eric and Koz at Twins Turbo put in getting the whole thing to work. The goals for the RTR-X project were lofty. Not only would the car be a styling breakthrough, but it was designed to be driven hard – and driven sideways. One of the things that struck me the most about the RTR-X is how it was literally built from nothing but a pile of new parts. There isn't a single original 1969 part on the entire car. It's a testament to just how far the performance aftermarket has come. 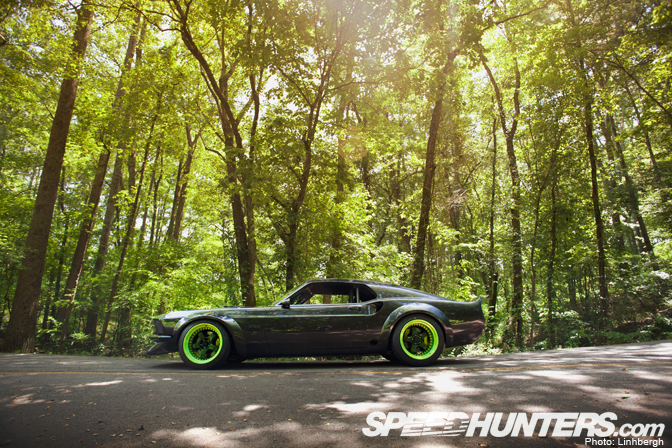 At the same time though, the RTR-X is anything but a catalog-built Hot Rod. In fact it's by far one of the most ambitious car builds I've ever seen. As soon as the new Dynacorn '69 Mustang shell arrived at Steen Chassis, the immense build process began. 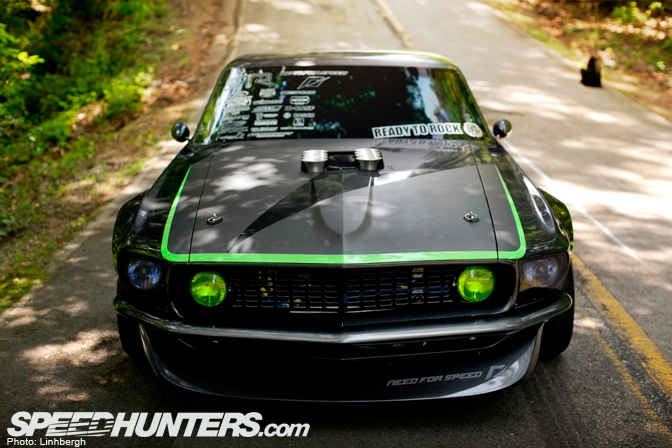 Within minutes the front half of the Mustang chassis was ripped off and replaced with a custom unit from Art Morrison. 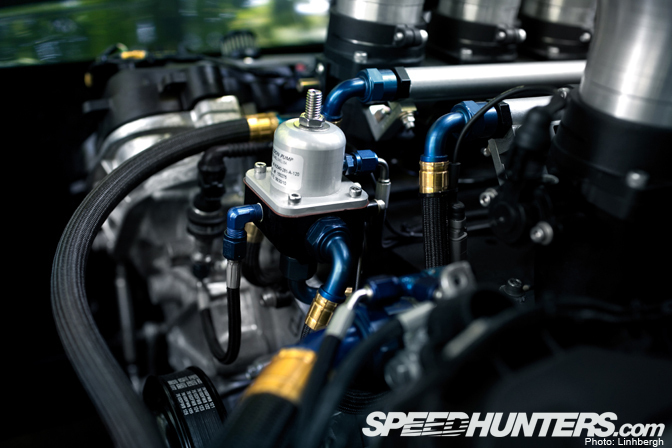 Behind every bit of work on the car there's a story that needs to be told – take the motor for instance. There are lots of 5.0-powered cars around these days, but when the build began in the spring of 2010 Ford's 5.0 motor was a new beast. Thanks to Vaughn's relationship with Ford Racing, the team was able to get their hands on the Boss 302R crate motor early on. Once he had the motor, Vaughn worked closely with MoTeC, who developed the ECU for the car. The MoTeC M800 is actually the first stand alone system to work with the 5.0 motor and is capable of controlling each of the four cams individually. The RTR-X could have easily been powered by a fully-built supercharged or turbocharged Ford motor, but massive horsepower and torque was not the goal here. 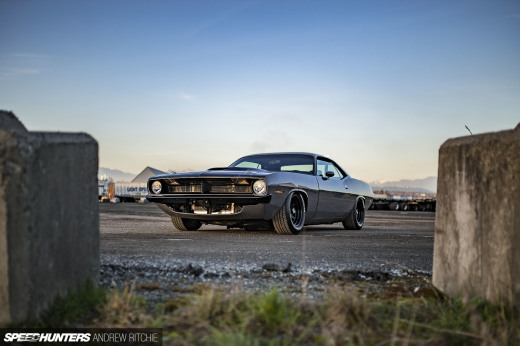 Its 401 wheel horsepower on 91 octane is not a big number by modern Muscle Car standards, but it's a perfect amount of usable, accessible power for this 3,160 pound chassis. 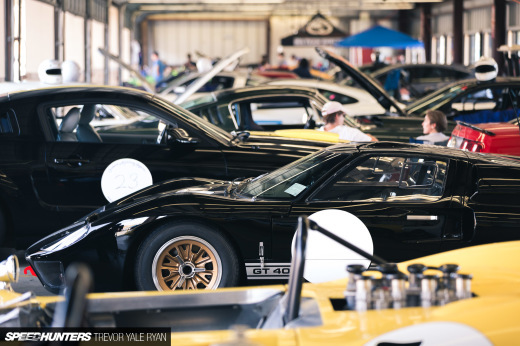 It's hard not do draw comparisons from the high winding Boss 302 Trans Am racers. Not to mention, the car just wouldn't be the same without the Kinsler individual throttle bodies popping through the hood. This was in fact a design feature from the beginning. 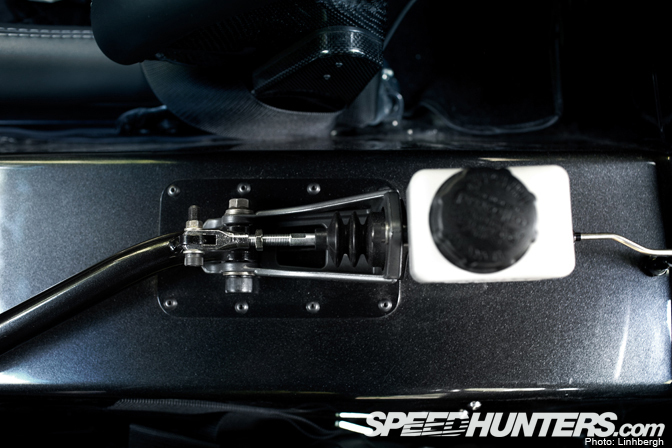 Also note the custom-built K&N filters in each throttle – another one of the unique details on this build and a necessity for keeping debris out of the motor. It's so hard to sum up all the work that's been done on this car in a simple feature. The headers are a good example of this. 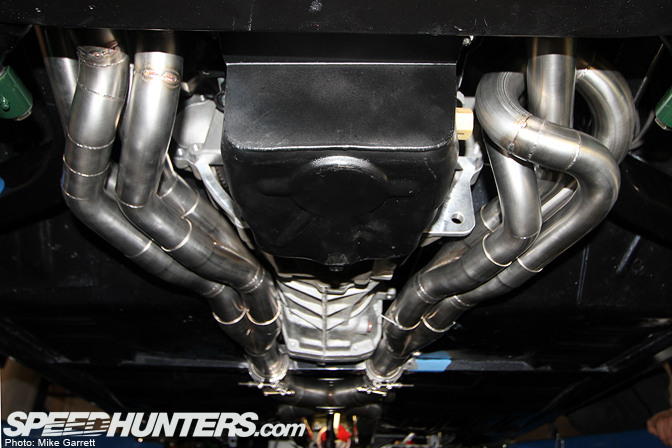 The boys at Twins Turbo put their skills to the test building manifolds that would clear the subframe when mounted to the wide 5.0 motor. The finished headers are pieces of art, but most people will never even see them. 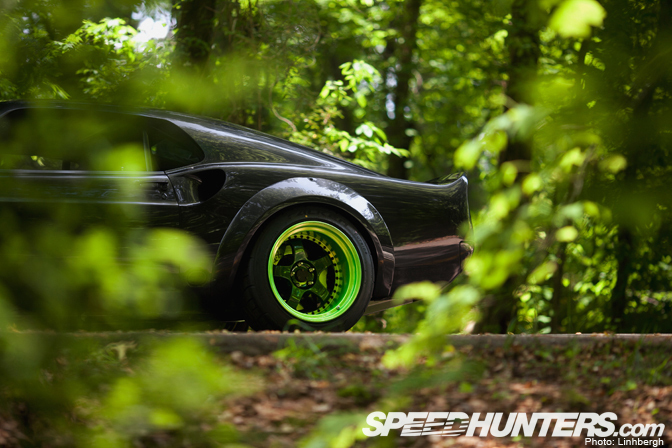 After seeing countless "needs more low" comments on the internet, Vaughn knew the RTR-X had to sit low and mean. At the same time though, it had to function properly. This would be no airbagged show queen. 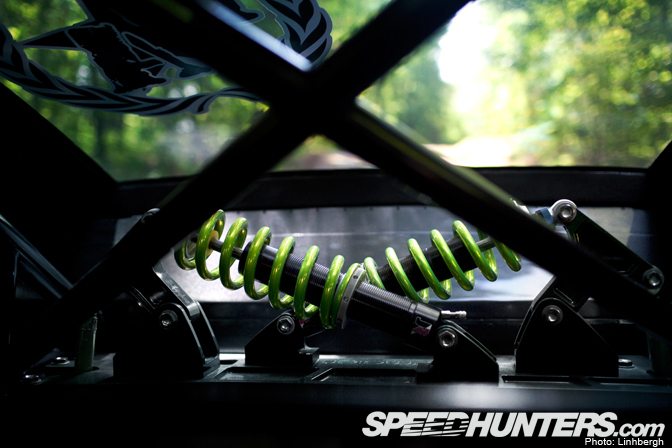 Up front the JRi coilovers work flawlessly in the Art Morrison subframe, giving a dramatic stance without sacrificing proper geometry or suspension travel. The same goes for the rear suspension, thanks to a Maier in-board cantilever setup and a custom three-link from Steen Chassis. 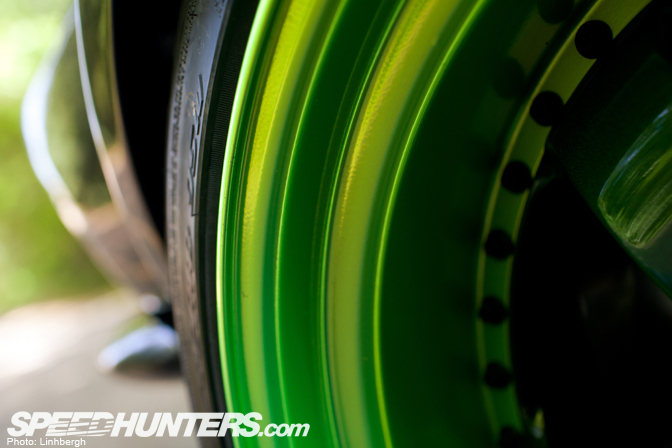 The wheel and tire setup was a key part of the build from the beginning. While some people fit the widest rubber they can, or alter their factory bodywork to fit a certain wheel, the RTR-X was literally built around its wheels. From the custom tubs to the perfectly formed flares, everything was done to make the Work Meisters look like they belong. In case you need a refresher on the wheel specs, try 18×10 -20 front and 18×12 -20 rear. 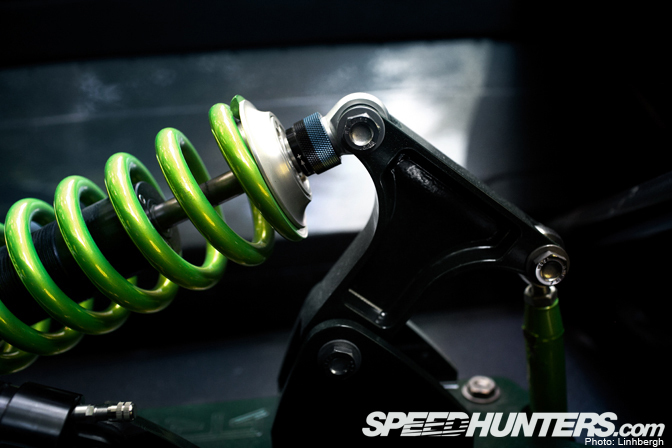 The bodywork is something that often gets overlooked on the RTR-X. Metal master Mark DeLong worked some magic when he filmed the seams, tucked the bumpers, and flush mounted the windows. He also formed the rear spoiler and side scoops by hand. Even more impressive is that all of this was done 100% in metal. It was also amazing to watch the soft-spoken Abraham Morales hand-form the front spoiler and fender flares out of clay – all while Vaughn watched and made sure everything matched his original vision. It wasn't uncommon for this kind of thing to last until the wee hours of the morning. Yet despite all the work done to the body, nothing looks out of place. Those unfamiliar with Mustangs might even think these are the factory lines. 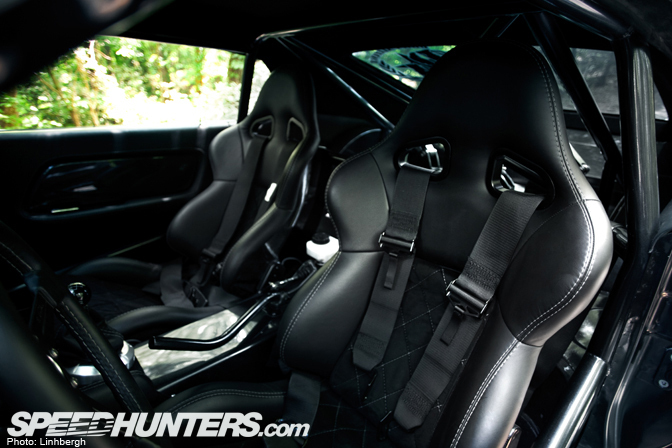 The interior of the RTR-X is a well thought out mix of both street car and race car elements. The team at Stitchcraft Interiors did a fine job giving everything a factory-like look. From some angles you might think you were looking at the cockpit of a modern sports car. 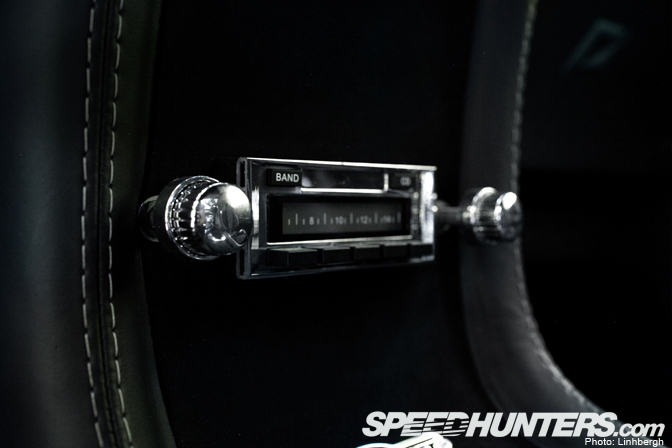 Vaughn wanted to make sure there was some sort of music to be heard when he drives the RTR-X. This throw back style radio unit fits the bill nicely. All in all, the interior is quite civilized. One look at the big e-brake handle though, and you know this thing was built for some tire-shredding fun. The display on the MoTeC SDL cluster says it all. 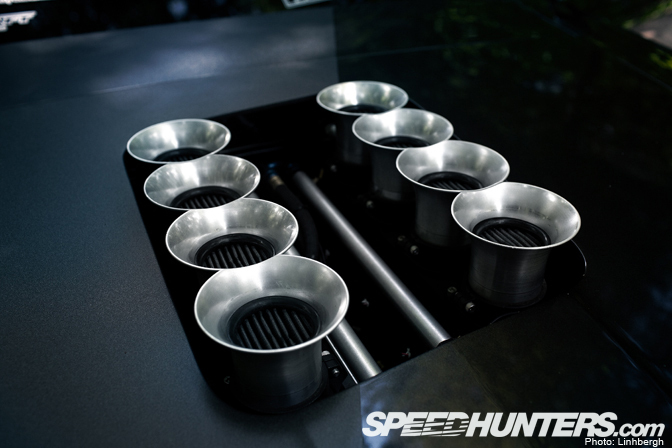 In many ways the the RTR-X is a machine that perfectly embodies the Speedhunters ethos. It's a car that's been influenced by automotive subcultures from around the world – all of which are seen on this site daily. The RTR-X is part street car, part race car. It's even part show car. It's classic, yet it's modern. It's functional and it's extremely unique. Most importantly, it's damn cool. 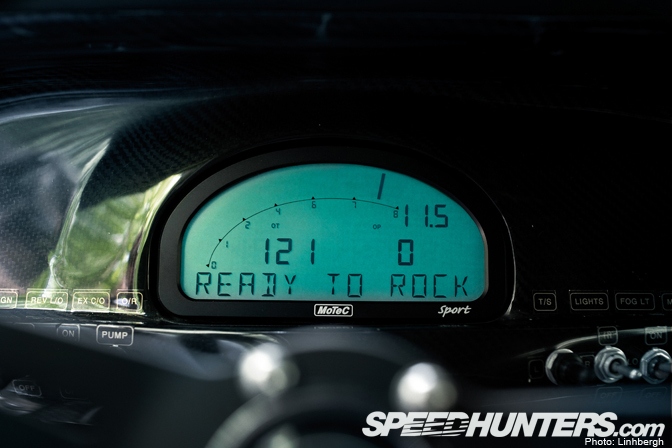 If just one vehicle could represent everything that Speedhunters is about, this would be it. In that sense the RTR-X belongs to you guys just as much as it belongs to Vaughn Gittin Jr.
* Build by Twins Turbo and Steen Chassis Signal Hill CA. 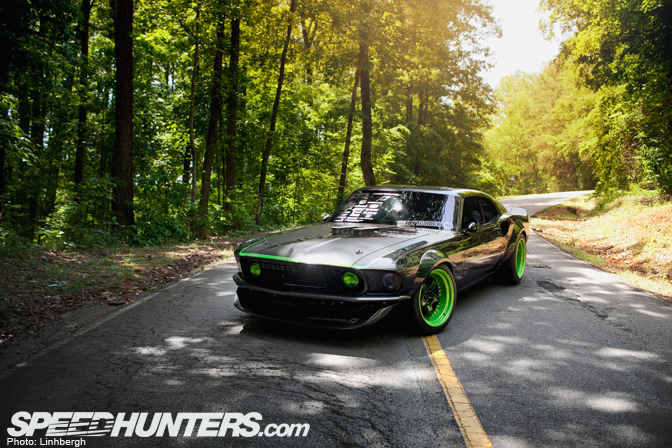 * Design by Vaughn Gittin Jr. and Andy Blackmore. * Metal body fabrication by Mark Delong and John Da Luz San Diego CA. * Painted by Auto Explosion Gardena CA. How much mula went into this? Wish it was raced or drifted competitively. I'm pretty sure I can count the drift threads on this car with one hand. It's a cool car none the less. That interior is gorgeous and the satin/gloss paint portions definitely do say NFS to the brain. 91 Octane? Are you serious? I knew the States got bad fuel, but that's appalling. Is that the highest grade available? I love this car has a massive presence! Not everyone will like it as a whole (it's still a car, so that's bound to happen). 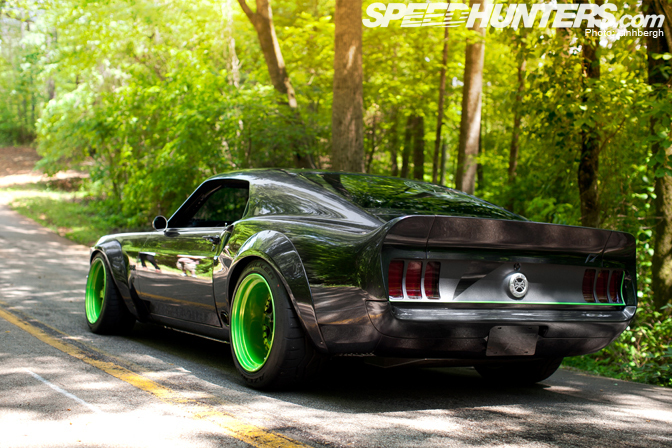 The best of it all is the work that was put into building the rtr-x - it's just mindblowing. I also like how a good old 69 wasn't used to do the job but a replica body: gotta keep those classics as classics! Would be much cooler if painted with BULLIT color. Flawless balance of form and function. Flawless. 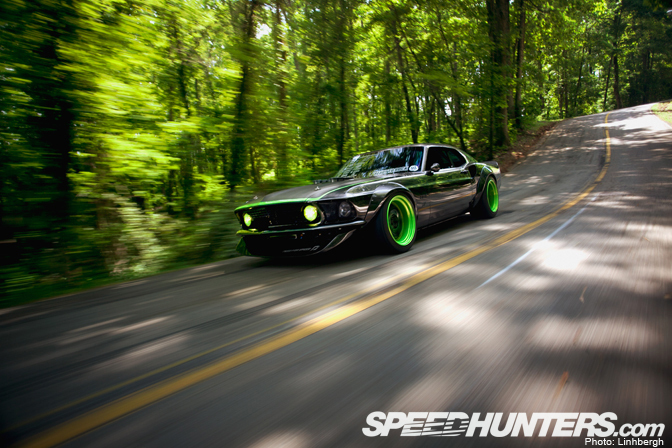 Not a huge muscle car fan, not a huge drift fan but would I drive that thing? helllllll yes. Awesome piece of kit. Bad thing about this car is the MoTeC SDL. is this the same place you shot mark arcenal's skylines? Perfect, first time I notice there was air filters in the velocity stacks. Love teh RTRX Thanks for building this car! so sick! never get tired of that ride. Desktop please! what happen if you drive it in the rain ? Octane is not a measurement of the quality of fuel. Such a sick car. I love everything about this build. Good lines, great wheels, and the itb's just make it all better. The RTR-X is beauty AND the beast!!! Big up to everyone involved in it's creation! Amazing vehicle, I hope there is to be some desktop images available soon from this shoot. Mother of God.. That is a beauty beyond imagination.. In last picture looks like RTR-X is just eating the road! What happens if it starts raining a lot :P? Can't be that good for the engine. I love this car, and I love this site.. you guys provide daily doses of awesome in many forms, from many disciplines.. but this thing seamlessly brings them all together in a package that I may very well call the coolest car I've ever seen. Thanks for writing this feature. The car is a work of art! Fantastic photos once again Linhbergh. We better be seeing some desktops. I like everything but the horrid green accents. Such a Beauty of a car. Love the interior mainly, Just sitting behind that wheel would be a thrill. The last picture is AMAZING!!!!!!!!!! I'm pretty sure those little filters are a detriment to ITB flutes. I'd rather see a big filter over the top when debris is a concern. It really pisses me off that you guys dont make desktops of every picture you post. Or atleast make it to where you can click on the image to enlarge it. So stoked! great write up, even greater machine! first sight of this car and i just completely fell in LOVE!!! one beautiful machine! Is there any way we can get some wallpapers of this beauty? All the pictures are outstanding, but the last one would look particularly god on my desktop. Can we get desktops of these pictures please? The car looks immaculate. If this does belong to us... can i borrow it on the first weekend of January? I will return it with a full tank of fuel. It's nice... but I prefer the Ring Brothers '70 fastback "Dragon". Having sponsors on your car is one thing but video game titles need to be kept off. 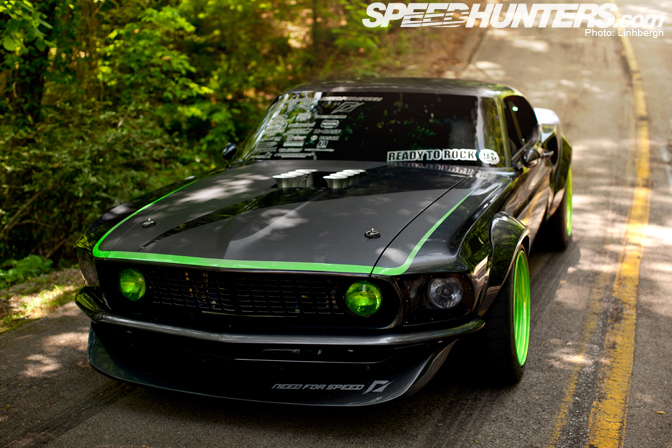 Otherwise, I think this is the only mustang I like! Thanks for the fuel ratings thing Jack, interesting read. please ... do some wallpapers of these awesome pictures !!! What is the name of the green paint used on the Work misters? That motor makes circa 420 HP stock - with aftermarket ECU and ITBs I'm guessing it makes more, not less as quoted in the feature. awesome build, but fix the crooked horn button! 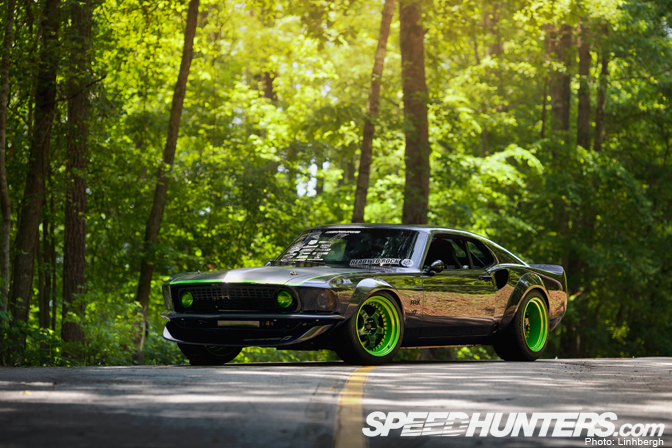 never have been a huge muscle car fan but that is AWESOME!!!!!! This one of my favorite cars of all time. i just like everything. Anyone know the brand of those seats, and possibly a part number? would love to have a car like this, except street legal..
@Mike Al isn't the whole point that it is street legal?? I got 1 it's a coupe tho but really what's the differance I can do the same mods. Been workin on it a lot lately and just lookin in on this for inspiration.